boring. Just look at these delightful Dog (and Cat) Cast Iron Hooks! Whether you are a cat lover or a dog lover, you can enjoy the functional beauty of your favorite right on your wall. Suitable for any place in the house -- from bathroom to living room. It is a convenient place to hang a leash, or that favorite cat toy. With a solid, sturdy, cast iron construction, these hooks are items that will last a lifetime -- and beyond. 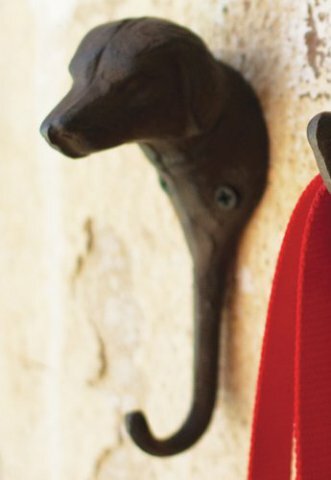 To order your Cast Iron Dog Hook, click here. To order your Cast Iron Cat Hook, click here. Fun Bright Cat and Dog Tail Hooks!